I love lemons. They are bright, refreshing, and smell divine. I’ve gotten in the habit of squeezing fresh lemon juice in a glass of water to help wake me up (and my digestive system) first thing in the morning. When I first started, I’m ashamed to admit that I would usually just throw the lemon peel away (or toss it in the garbage disposal). But when my lemon habit really took off I started storing the peels. I’ve collected a lot, actually. And thanks to the internet, experimenting, and other tidbits along the way I’ve also collected a lot of things you can do with those lemon peels. So without further ado, here are 31 uses for lemon peels. Did you know that lemon peels are nutritional power houses? Seriously? Lemon Peels contain a spectrum of vitamins, minerals and fiber (things like calcium, potassium, and vitamin C) that can give your menu a nutritional boost. And even though you would have to consume large amounts of peel to glean significant nutritional benefits, it doesn’t hurt to throw in some peel when you can. Remember, organic will be your best best when consuming the peel to avoid eating any pesticides. One of my favorite seasonings, and easy to make. Check out Lemon Pepper Seasoning by Simply Scratch. Um. Yum. What more do I need to say? I love this Candied Lemon Peel recipe by Luna Cafe. Doesn’t it just sound awesome? I haven’t tried this yet, but it’s definitely on my “to do” list. Check out this Lemon Sugar Recipe by Baking Bites. Give your olive oil a yummy makeover for a bright flavor. Here’s a simple recipe to get you started. Sometimes I’m amazed at the things I never realized you could make yourself. Like this lemon extract. 7. Lemon twists and ice cubes! Brighten your drinks by putting twists of the peel into ice cubes. Perfect for summer parties. Use a vegetable peeler (like this) or knife to make long strips, cutting away from the white pith which can be quite bitter. Again, these can be frozen. Another “what more do I need to say,” right? Get the recipe from bon appetit here. Adding some lemon peel (with traces of pulp and pith removed) to your brown sugar can help keep it moist and easy to use. Also known as lemon vinegar, this stuff is awesome at cutting grease and disinfecting. 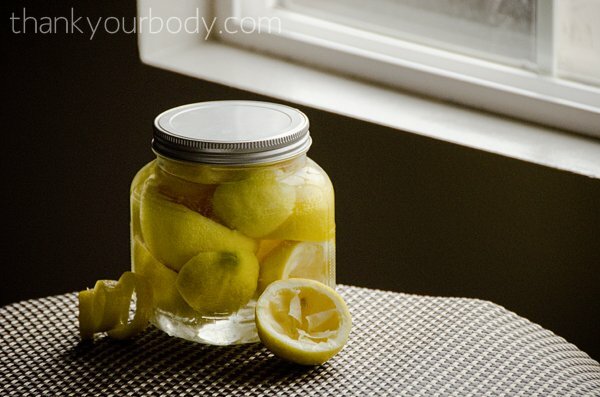 To make, simply place a bunch of lemon peels in any sized glass jar (mason jars would work great). Pour white vinegar over. Put the lid on and let it sit for 2 weeks (I promise, it’s worth the wait). Then strain the liquid. Combine this with water (using a 50/50 ratio) and then use as you would your normal all purpose cleaner. Place small slices of lemon peel along thresholds, windowsills, door entrances, or near cracks or holes where ants or pests are lurking about. I haven’t tried this one yet (living on the third floor does have some advantages… no big ant problem where I live), but apparently ants do not like lemon and will not enter your home. Lemons are also effective against roaches and fleas. Place a lemon peel or two inside your fridge to absorb smells and bring a bright citrus scent. Throw a few lemon peels in the bottom of the can. This will also help absorb odors and keep things smelling fresh. This idea has been floating around pinterest for some time, and with good reason. You’ll make your house smell heavenly simply by adding lemon peels to simmering water. Throw in some cloves, cinnamon sticks, and orange peels. This adds a wonderful scent and humidifies the air. 15. Clean your tea kettle or coffee pot. To clean your coffee pot: Simply add your lemon peels with some ice and salt. Whirl everything around a minute or two and the dump and rinse. 16. Sanitize your cutting board. Lemon’s natural acidity provides great antibacterial properties to home cleaning. After properly cleaning your cutting boards, rub the surface with half a lemon. Let it sit for a couple of minutes before rinsing. 17. Freshen and deodorize the dishwasher. Add lemon peels to your dishwasher every now and then to help rinse and deodorize it. We don’t use our microwave much, but I wish I knew this secret back when I did! Add lemon rinds to a microwave-safe bowl filled halfway with water. Cook on high for five minutes, allowing the water to boil and the steam to condense on the walls and tops of the oven. Remove the hot bowl (carefully!) and wipe away the mess with a towel. Yes. 19. Deodorize the garbage disposal. Use lemon peels to deodorize the garbage disposal and bring that amazing citrus smell to your kitchen. Fake lemon cleaners have nothing on the real thing. Simply put a peel or two down the disposal, flip the switch on (with the water running), and done. Bake discarded lemon peels until they darken. These create natural, fragrant firelighters. So cool, and just in time for grilling season! Dry your lemon peels (either out in the sun or in a dehydrator) and place them inside of fabric sachets. Add spices, as desired such as cinnamon, clove, nutmeg and cardamom. Place in drawers to freshen. 22. Clean your stainless steel, polish your chrome, and make your copper shine! This one was my favorite as we’ve had some nasty residue on our steak knives that I’ve been trying to get off for a while. Simply sprinkle some sea salt on the metal, and then use the lemon peel to scrub away any dirt, grime, or stains. Rinse and polish! This is one of my most common go-to uses for lemon peels. This will really perk your skin up. Go here to get the Skin Brightening Scrub recipe from Mommypotamus. Use a half lemon sprinkled with baking soda on elbows; just place your elbow in the lemon and twist the lemon (as if you are juicing it) for several minutes. Rinse and dry. 28. Use as a skin tonic. Lemon peels can be very lightly rubbed on your face for a nice skin tonic; then rinse (be careful around your eyes). 29. Make a sugar scrub. Mix 1/2 a cup of sugar with finely chopped lemon peel and enough olive oil to make a paste. Wet your body in the shower, turn off the water, and massage the sugar mix all over your skin. Rinse off and bask in your smooth skin. 30. Make a scented humidifier. If your home suffers from dry heat in the winter, you can put lemon peels in a pot of water and simmer on the lowest stove-top setting to humidify and scent the air. This is one of my favorite uses for lemon peels… especially during the holidays. 31. Make a foot soak. Boil citrus rinds for several minutes. Allow to cool completely and strain. Add ¼ cup cow or almond milk, 2 tablespoons of cold pressed olive oil and a couple of drops of lemon essential oil. Soak feet for about 20 minutes and then pat dry to moisturize and soften feet. 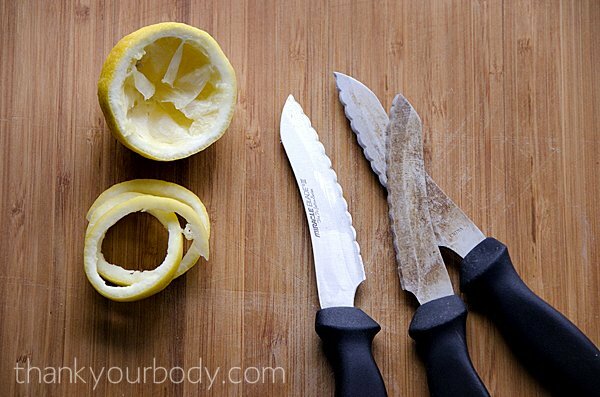 What are your favorite uses for lemons and lemon peels?